The search of one's own personal reality and self-identity. 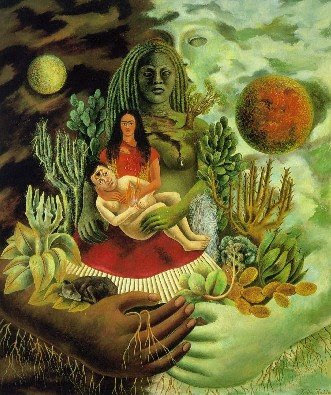 The Love Embrace of the Universe, the Earth (Mexico), I, Diego and Senor Xolotl, 1949. Oil on Canvas, 70x60.5cm. Private collection, Mexico City. 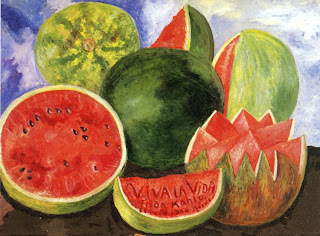 The above is the image of one of my favourite paintings by the legendary Mexican surrealist artist Frida Kahlo. How beauteous!! I can never forget the first time I saw her paintings, 13 years ago, at Mexico City Frida Kahlo Museum (Museo Frida Kahlo) in Coyoacan aka the Blue House. I was in my early teens. That was the time I fell in love with her paintings. I was lucky that my parents brought me along to travel to Ciudad di Mexico from the other side of the world. The experience was amazing. Viva La Vida (Long Live Life), 1951-1954. Oil and earth on hardboard, 52x72cm. Diego Rivera and Frida Kahlo Museum, Mexico City. She once said to her husband, Diego, "My blood is the miracle that travels from the veins to the air from my heart to yours". 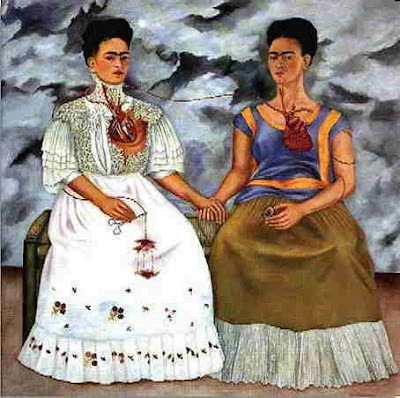 She painted Two Fridas at the time of her divorce. Clearly, she is picturing her feelings of sorrow and sadness at that time in the painting. Inner reality versus outer reality. Being who you are, or being someone others want you to be. Are you willing to be someone else for the one you would die for? Is love really worth sacrificing your own self-identity, other needs and wants? Would you conform just because? Hate me? Love me? Do I really care? This painting really excites me, emotionally. What are the thoughts that comes to mind when you look at this painting? My first post. Random thoughts.